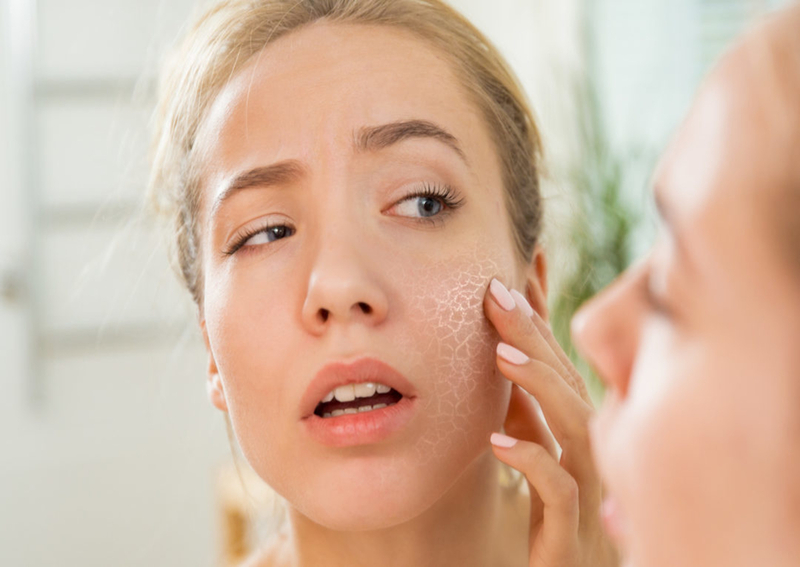 Dry skin is not only unappealing to look at, but it can also be irritating and painful. If you have dry, itchy, or red skin, it can be frustrating to figure out what’s causing it. Here are the seven most common things that cause dry skin! Dry air is the most common cause for dry skin, especially during the winter months. Cold, harsh air draws the moisture out of the skin, leaving it irritated and flakey. It’s not just the outside air either; indoors air artificially heated is also just as dry and bad for your skin. The best way to combat dry skin caused by the weather is to find a good moisturizer. Since your skin is fighting dry air both indoors and outdoors, winter is the perfect time to come in for a professional hydrating facial! This will keep your skin glowing until spring. Most commercial soaps are as great for our skin as advertisements lead us to believe. From harsh chemicals to overuse, soap is a common cause for dry skin. Cleansing it strips the skin of moisture, so overusing soap can actually be harmful to your skin. Try switching to mild soaps that have fewer chemicals. If dry skin persists, try only washing with water and using soap only when necessary. If the problem persists, come in for a complimentary skin consultation to see how we can help. Thanks, Mom and Dad! Research now says that dry skin may be caused by genetics. The protein filaggrin plays a role in the forming and hydrating the skin barrier, but some people inherit genetic mutations that control the production of this protein. This can lead to dry skin or skin conditions such as eczema. If your dry skin is caused by genetics switching moisturizers isn’t going to magically solve it. In this case, we would recommend regular facials to routinely introduce moisture into the skin. Yes, your long and hot showers may be the cause of dry skin. Prolonged exposure to water, especially hot water, washed away the natural oils on your skin. If your skin feels tight after bathing it’s because it’s dry. Areas with hard water, water that contains a high concentration of minerals, can also lead to dryness. They leave a film on the skin, which plugs glands and causes dryness. Limit your showers and baths to under 10-15 minutes when possible. Try to keep the water warm, not hot, to prevent unnecessary dryness. If you have hard water in your area, invest in a water softener, which will help eliminate some of the minerals. Exfoliating is an important process to achieve healthy skin. It scrubs away the dead skin and unclogged pores, which allows natural oils to come through and keep skin moisturized. However, over exfoliating can have the opposite effect. Instead of only removing dead skin cells you may be removing healthy ones, which can cause irritation and redness. We recommend you only do light exfoliation at home. Leave the intense exfoliation to the professionals! Most people don’t know how to correctly apply their moisturizer. While this won’t directly cause dry skin it also won’t help it. People make the mistake of applying moisturizer to dry skin when it’s least likely to work. Put on moisturizer when the skin is still damp. The best time is after getting out of the shower. Pat yourself dry so the skin isn’t sopping but is still wet. This way the moisturizer traps the water onto your skin, keeping it hydrated. Just like with soap, many of the cosmetics and cleaners we use in our daily life aren’t great for our skin. The cause of your dry itchy skin may be from perfume, fabric softener, deodorant, or your makeup. Make sure you take a look at the ingredients in the products that interact with your skin. Try to limit the number of products that interact with your skin. Natural products tend to use less harsh chemicals and irritating scents. You can also check out the products we carry in our clinic, as they’re non-harmful to the skin. If you’re not ready to part if your favorite cosmetics yet, try to only wear them when necessary and remove them before bed! Contact us today to set up a complimentary skin consultation so we can learn what’s causing your dry skin and determine how to rejuvenate it!